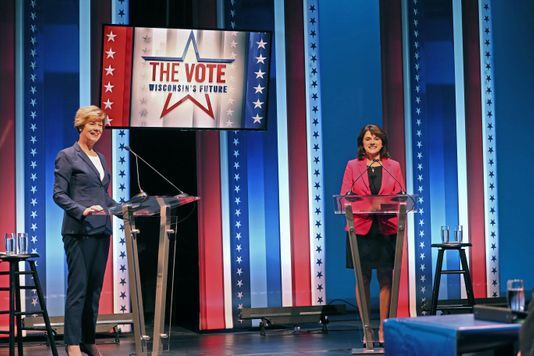 By Tom Kertscher on Monday, October 8th, 2018 at 8:58 p.m.
Let’s look, from a fact-checking perspective, at six issues raised during the first debate between U.S. Sen. Tammy Baldwin, D-Wis., and her Republican challenger, Leah Vukmir, ahead of the Nov. 6, 2018 election. We’ll review what was said during the Oct. 8, 2018 debate. Then we’ll cover what we know from checks by PolitiFact Wisconsin, PolitiFact National, PolitiFact Florida and PunditFact. The debate: Vukmir claimed that Baldwin for months sat on a report that only she had detailing the overprescription of opioid painkillers to veterans at the Tomah VA facility, then tried to fire a staff member and offer the staffer "hush money." Baldwin noted that the staffer’s allegation of a cover up was dismissed by a Senate ethics committee as being without merit. The details: Baldwin was the only member of the Wisconsin congressional delegation to initially receive the report, and she didn’t make the report public or go public with her concerns until the overprescribing scandal made news. But we found no evidence Baldwin took active steps to cover up the matter, and the Senate committee dismissed the staffer’s complaint, saying it was without merit. The debate: Vukmir claimed Baldwin announced her opposition to Judge Brett Kavanaugh 48 hours after he was nominated to the U.S. Supreme Court by President Donald Trump, and never met with Kavanaugh. The details: Baldwin did announce her opposition to Kavanaugh two days after his nomination. She did not meet with him, though she said she wanted to, prior to his confirmation by the Senate. The debate: Baldwin talked about a lawsuit that she said could result in insurers once again being allowed to deny health coverage to people with pre-existing conditions. Vukmir suggested that people with pre-existing conditions were covered before the Affordable Care Act’s prohibition on insurers denying coverage to such people. The details: Baldwin has cited a high estimate in saying 2.4 million people in Wisconsin have pre-existing conditions, when the number of people who could have been denied coverage because of pre-existing conditions prior to the Affordable Care Act is estimated at 852,000. Meanwhile, Vukmir has said people with pre-existing conditions should be covered, but she supports repealing the Affordable Care Act and hasn’t been clear about how people with pre-existing conditions would then be covered. The debate: Baldwin was asked about her support for "Medicare for All," legislation that would cost $32 trillion over 10 years. She said it would be cheaper than "doing nothing." The details: The legislation would essentially expand Medicare to cover everyone, rather than just those older than 65. The estimated cost is over $32 trillion. There is debate — even within the same study — about whether the plan will lead to the nation spending less money, or more money, on health care. The debate: Vukmir claimed President Barack Obama’s administration separated parents from their children at the U.S.-Mexico border, like Trump’s administration did, and that Baldwin did nothing about it during Obama’s tenure. The details: Obama’s immigration policy specifically sought to avoid breaking up families when they arrived at the border without permission. While some children were separated from their parents under Obama, this was relatively rare, and occurred at a far lower rate than under Trump, where the practice flowed from a zero-tolerance approach to illegal border-crossings. The debate: Vukmir, a state senator, was asked if she regretted a vote in the Legislature on oral chemotherapy, and Baldwin said Vukmir had voted with insurers on the bill. The details: Vukmir did align with insurance companies and voted against a law that stops them from charging patients higher deductibles, copayments or coinsurance for oral chemotherapy than they would pay for traditional chemotherapy.